Week nine of baking and pastry yielded lots more bread – 3 baguettes, 2 challah loaves and a pint of ice cream to be exact! 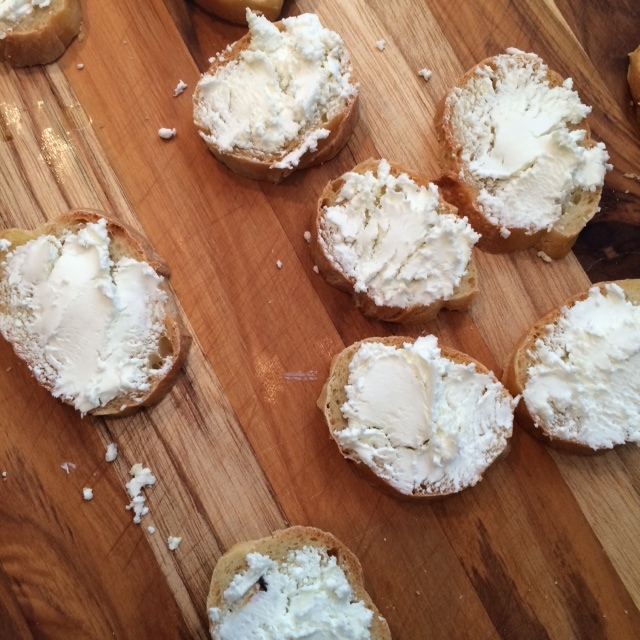 I selfishly took everything home and now I have more bread than I know what to do with…until I thought of crostini. I whipped this up for an afternoon snack. If you’ve never caramelized onions before, the trick is to be patient and make sure you have at least 45 minutes to let them simmer. You can’t rush the process, otherwise you won’t get that perfect, yummy caramelization. Bon Appetit has some great tips here. Heat the butter and olive oil in a 12” skillet over medium heat until the butter is just melted. Add the onions and stir to coat with the oil and butter. Keep the onions on the heat for 40-45 minutes, stirring occasionally until well caramelized. Once the onions are well caramelized, deglaze the pan with the wine to reincorporate the fond that has formed on the bottom of the pan. While the onions are cooking, slice and prepare the bread. 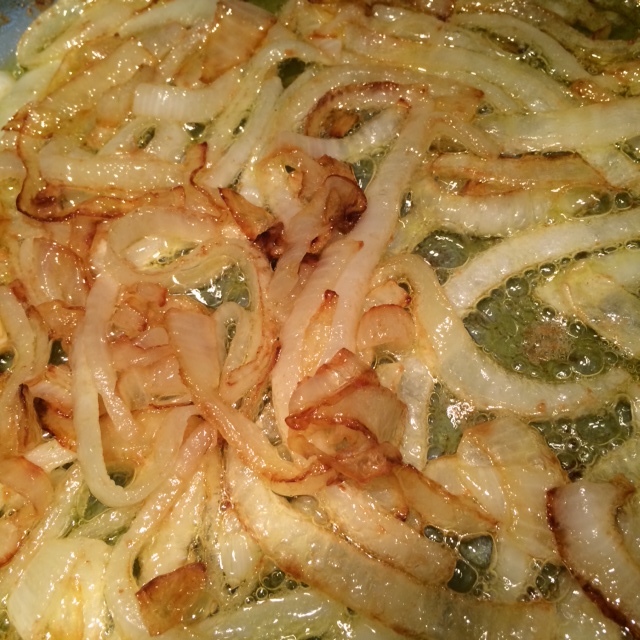 Turn on the broiler to low when there are about 5-6 minutes left for the onions to cook. Coat the top of the bread with olive oil, then spread a good amount of goat cheese on the bread and top with a sprinkle of salt and pepper. Place in the broiler and broil for 3-4 minutes until the cheese is heated through. 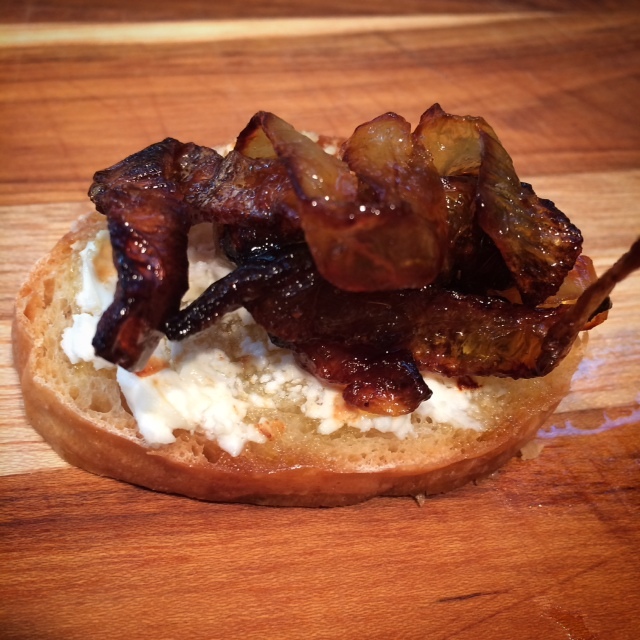 Top the crostini with the onions and serve.